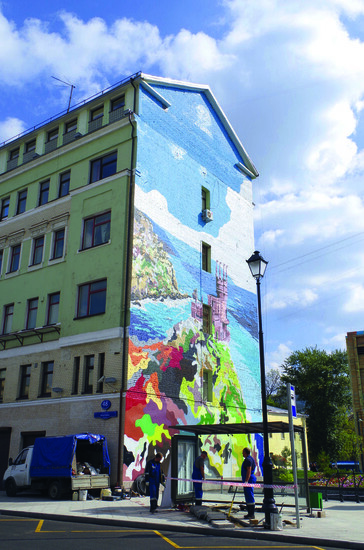 Apart from the sights along Moscow’s main streets, there are some hidden gems that visitors often pass by without even noticing them. 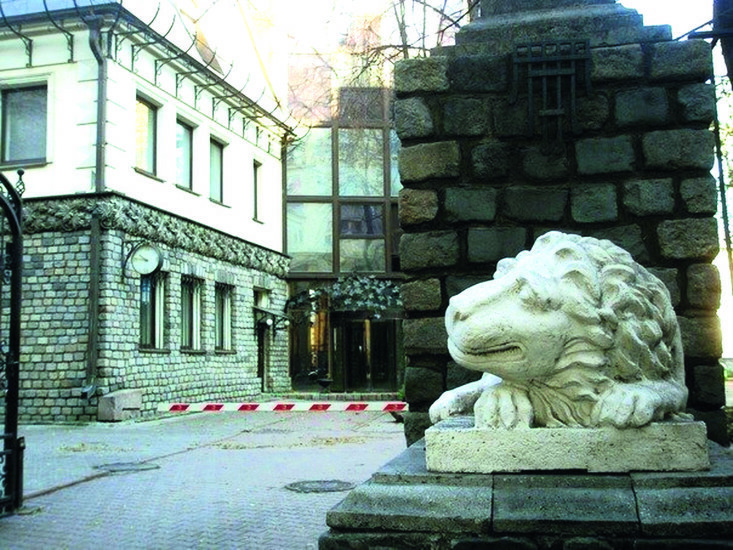 These gems are the so-called “dvoriki” (courtyards). 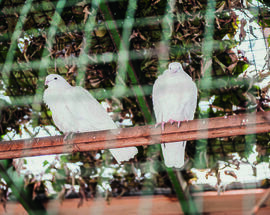 Cute and historic, these courtyards should definitely go on your list of things to see. The leafy green yard provides an oasis of freshness just a few steps away from Tverskaya, one of Moscow's busiest streets. After you’ve seen the exhibits at the museum, take a few moments to contemplate the long and turbulent history of Russia. The yard in front of the museum is also quite cute, with benches from which you can admire the tanks. 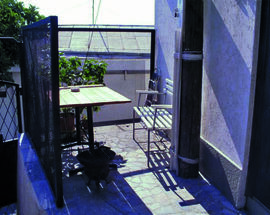 Entering this courtyard is like entering a whole other world, like that of Master and Margarita! 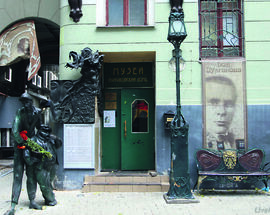 An old Mercedes, statues of characters from Master and Margarita and bas-relief by Alexander Rukavishnikov adorn the courtyard of the entrance to 302-bis Bolshaya Sadovaya street. A bench like the one that poet Ivan Bezdomny and magazine editor Mikhail Berlioz were sitting on before the grey-suited stranger Woland joined them will teleport you to the starting scene of Bulgakov’s most famous novel! Surrounded by an old city mansion dating back to the 17th centry, the center piece of this “dvorik” is of course, a statue of a pensive Mr. Gogol himself. After visiting the museum there's no better place to sit down under the shade of the leafy trees and reread your favorite Gogol piece. You won't even notice the bustle of the nearby streets. 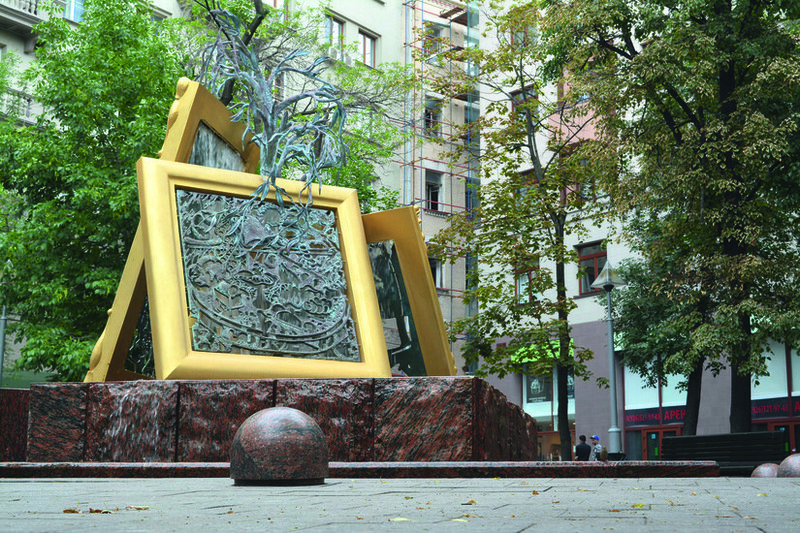 The Moscow Museum of Modern Art (MMOMA) is a museum of modern and contemporary art, the project of Zurab Tsereteli, president of the Russian Academy of Arts and Russia's most renowned contemporary sculptor. 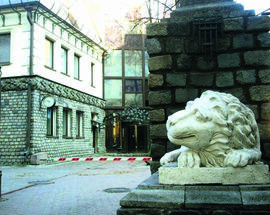 The huge courtyard of the Petrovka branch of MMOMA alone warrants a trip, even if the museum doesn't have anything on. 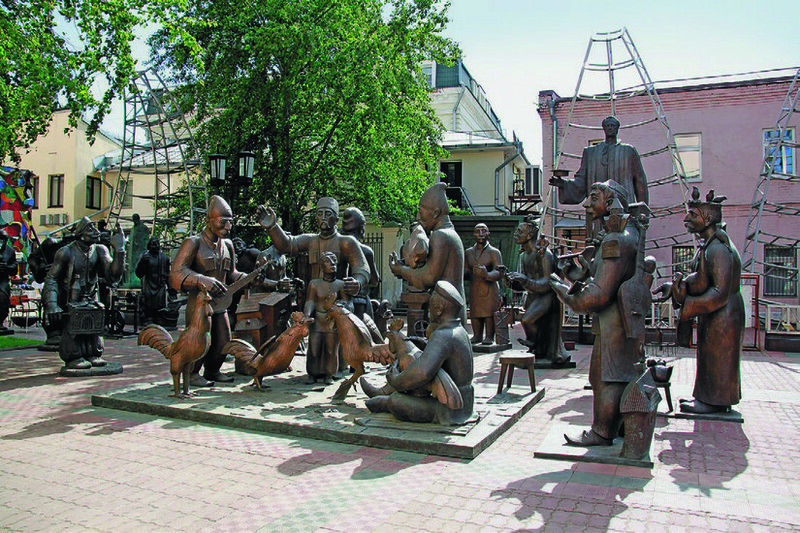 Scattered all around the yard are sculptures of all sizes, many of them created by Tsereteli himself (sculptures of Vysotsky, Kandinsky, Malevich holding his black square, Brodsky, Akudzhava, Pirosmani and Rousseau and the souring statue of St. Nina). 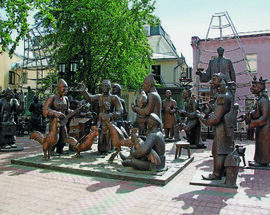 Other sculptors you can find here are Yury Orekhov, Mikhail Dronov, Mike Munyaradzi. The center piece of the yard is a fragment of the Eiffel Tower's spiral staircase! 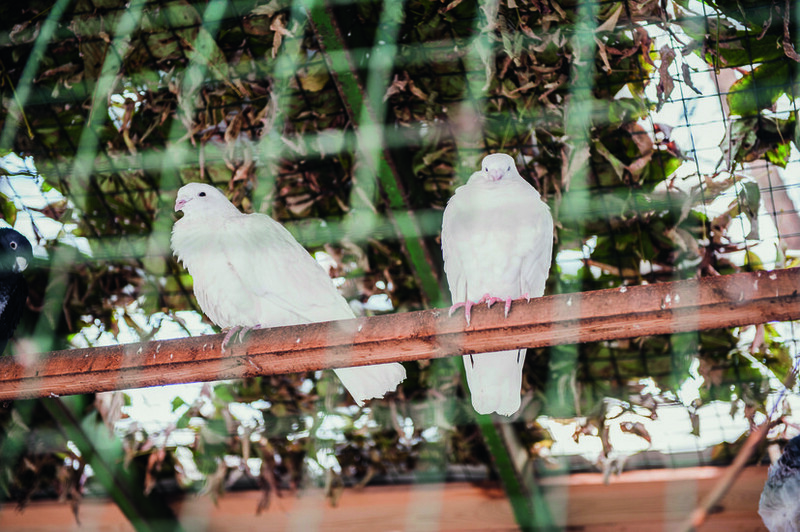 There are plenty of benches to sit and marvel from, as well as a cute cafe with outdoor seating in warmer months. Between 1949 and 1955, the world-renowned Russian poet, actor and singer/songwriter Vladimir Vysotsky lived in apartment 4 on Bolshoy Karetny Pereulok, 15. Barely noticeable, the walls of the building feature a plaque with words from a song of his "where are you not today? On Bolshoi Karetny" and a sculpture of his face and hand holding a guitar with the words "I think we won't leave with the guitar for our deserved and unwanted rest". It was here that the legendary bard spent his earlier years and it is the courtyard that his famous song “On Bolshoi Karetny” with the lyrics "Where are they now, your 17 years?” is dedicated to. Arrive with your favorite Vysotsky songs playing in your earphones. Amidst the tangled of streets Pokrovka Street and Pokrovsky Bulvar rises a towering spire. If you see it, that means you’ve reached the Sts. 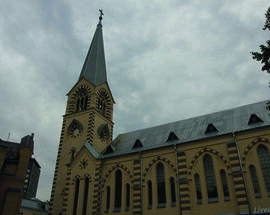 Peter and Paul Evangelical Lutheran Cathedral. Go through the gate and look inside the church, where soaring arches heighten the effect. 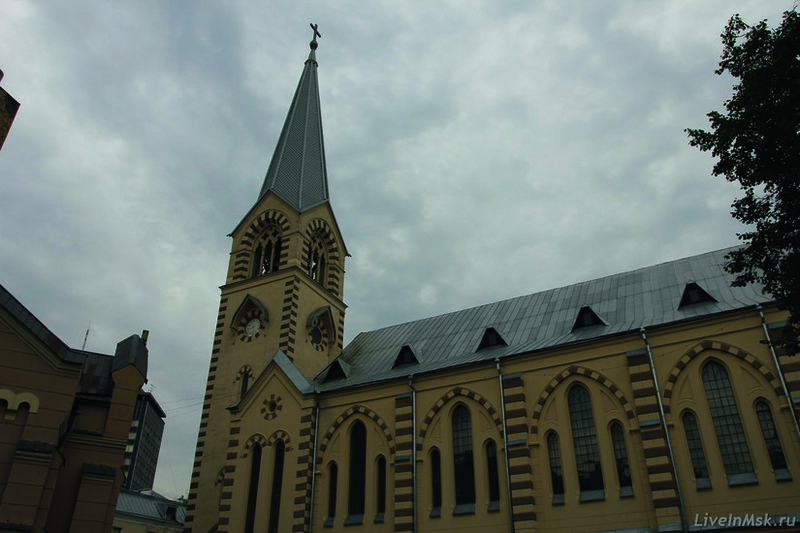 It's one of two active Lutheran churches in Moscow and it has a rich and complex history. 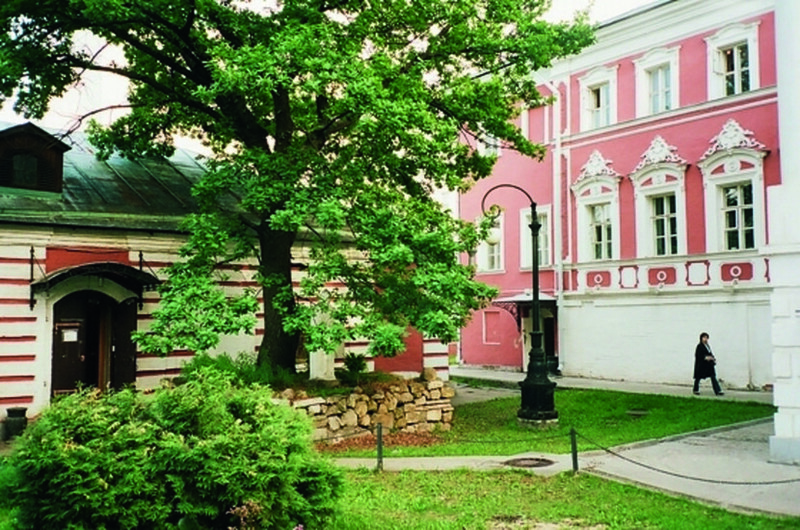 In the courtyard you will find the old red-brick chambers where Ivan Mazepa (Hetman of Zaporizhian Host in 1687–1708) once lived. 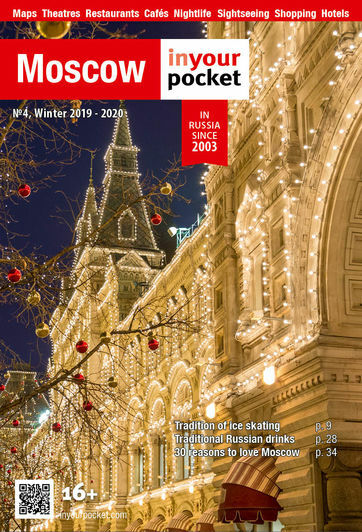 On weekends the faithful celebrate religious holidays and the neatly kept green lawns and an abundance of trees almost give the courtyard a countryside feel although you're actually in the heart of busy, bustling Moscow. Cute touches like colorful "sweaters" for the trees and some of the poles and a sandbox for kids to play make it a pleasant place to sit and read something in the sunshine. 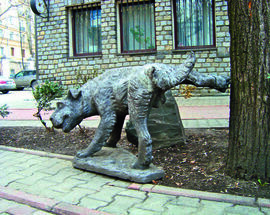 Right next door is the Moscow Artists' Union and as you would expect, the courtyard garden is full of eclectic sculptures and various other arts pieces. 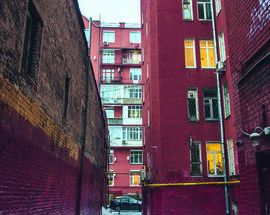 In the furthest courtyard of Armyansky Pereulok (after turning from Maroseika St.) you will something not very typical of Moscow: little two-level houses with spacious verandas on the upper floors. It’s as if you’ve teleported from Moscow to somewhere in Russia’s south. 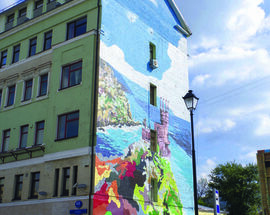 The courtyard here isn’t so hidden and you will notice the beautifully landscaped flowery lawns and building facades painted with images of Crimea (Swalllows Nest, cliffs and the sea). 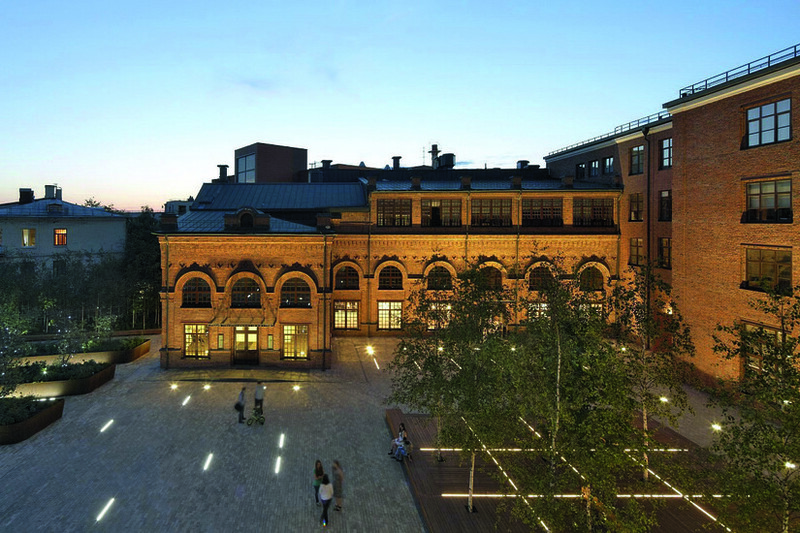 This renovated courtyard also has a basketball court and plenty of seating – it’s a real oasis of freshness and sunshine in sometimes gloomy Moscow. 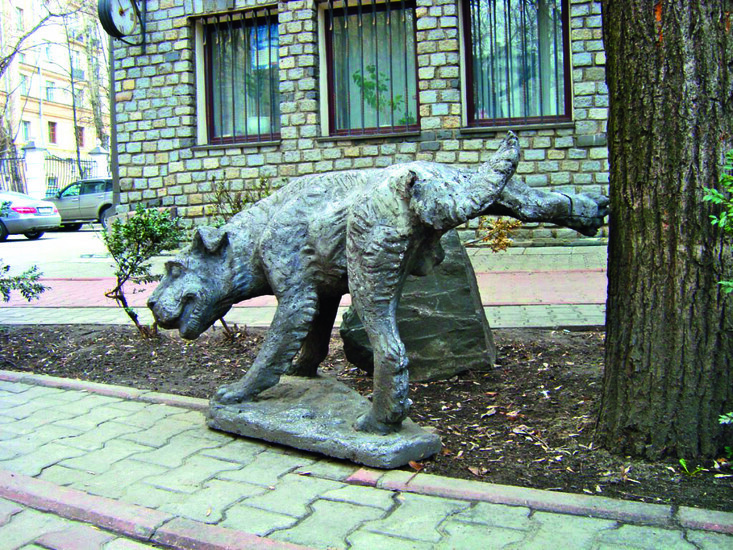 Tucked away from the hustle and bustle of the Sadovoye Koltso, this spacious and beautiful courtyard is home to many different statues: smiling lions, a fountain with a girl holding an umbrella, a man sitting on a bench while his dog is doing its business and other whimsical creations. Very leafy and very peaceful, this is the perfect place to take a little break and admire the lampposts and the big round clock. Not far from the courtyard you’ll find the best place for trainspotting in Moscow: over the line joining the Kursky and Leningradksy railway stations. 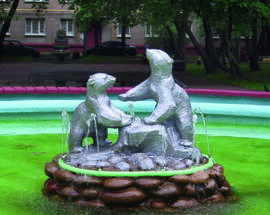 On the corner of Prechistinka Street and Levshynsky Pereulok you can find a small courtyard with two semi-round houses. 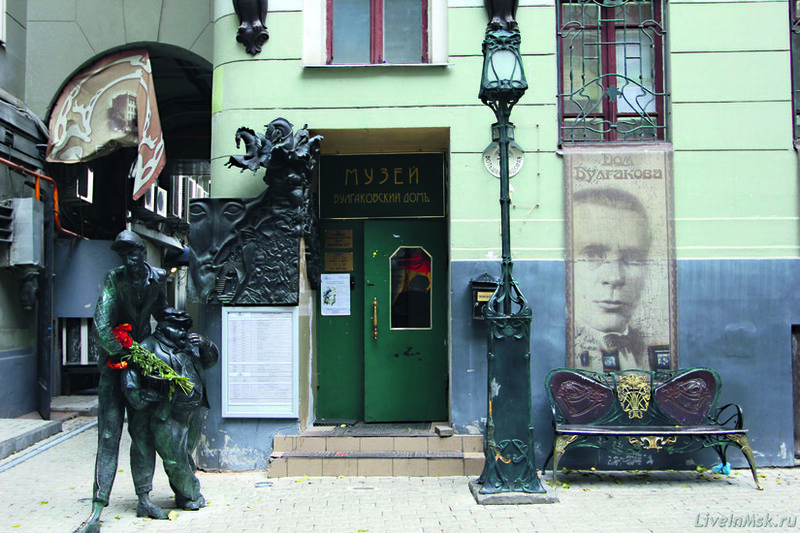 One of them comprises various workshops and a statue to the Soviet poet, writer, musician, novelist and singer-songwriter Bulat Okudzhava. 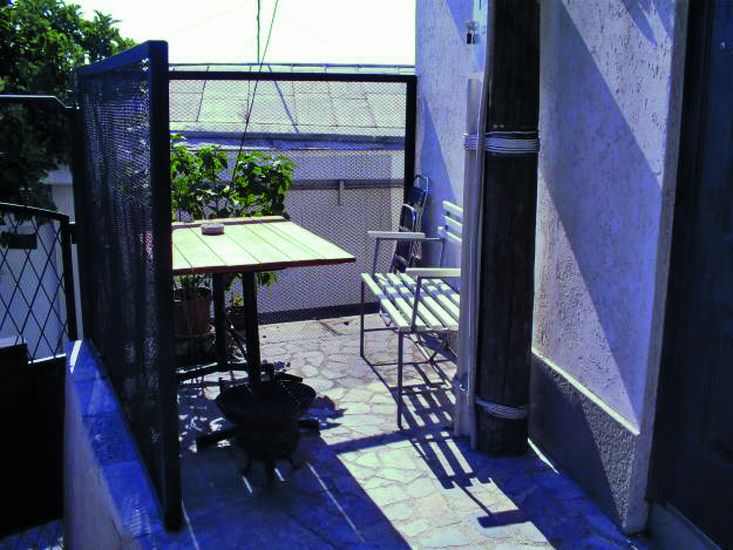 The other one is made up of communal apartments and the inhabitants create a warm and welcoming atmosphere as they cook together outdoors and discuss the latest matters with each other. On your way from the Tretyakovskaya metro station to the Tretyakov Gallery you will walk through a charming little courtyard/square. 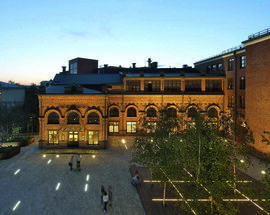 Until 2014, this courtyard/square did not have a name. 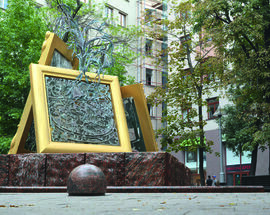 Now it's called Shmelev Square, after renowned Russian writer Ivan Sergeevich Shmelev. 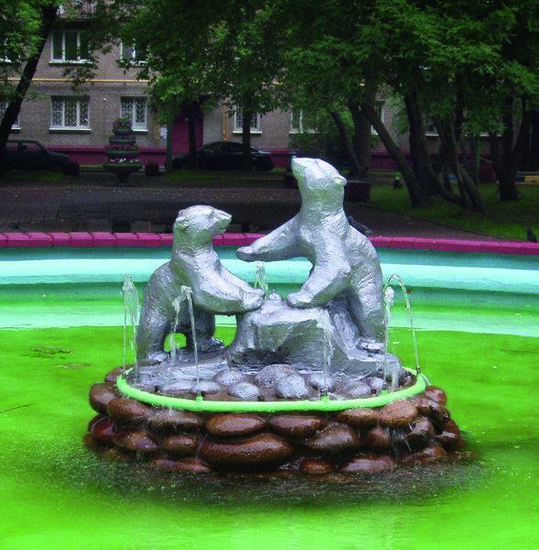 In the middle of the spacious, leafy courtyard/square there's a beautiful piece of art fountain that was erected in honor of the Tretyakov Gallery's 150th birthday. 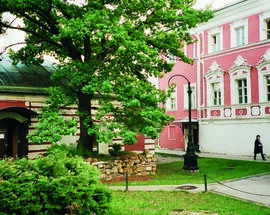 The courtyard is surrounded by historic mansions and cozy cafes where you can replenish the energy lost after hours of walking around Moscow's most famous art gallery.